It has been my drive for many years to work on research that is directly relevant for the society. I also like Hippocrates quote “Let food be thy medicine and medicine be thy food”. Consumers today want fresh produce year-round, locally grown without pesticides and of high nutritional quality. With LED light recipes used in vertical farming it is becoming possible to increase production yield and at the same time deliver a highly nutritious product. Understanding plant and light interaction is important to be able to produce food efficiently and of a high quality for a growing population. 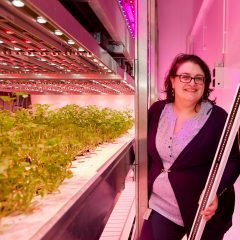 LEDs are enabling new research on plant growth. The horticulture industry must learn again how to produce food in the context of vertical farming. Light recipe research is crucial for vertical farming because it interacts with all the parameters controlling the plant growth. This control is in the hands of the farm operator who needs a very extensive knowledge and know-how in a field where not so much information is available yet. 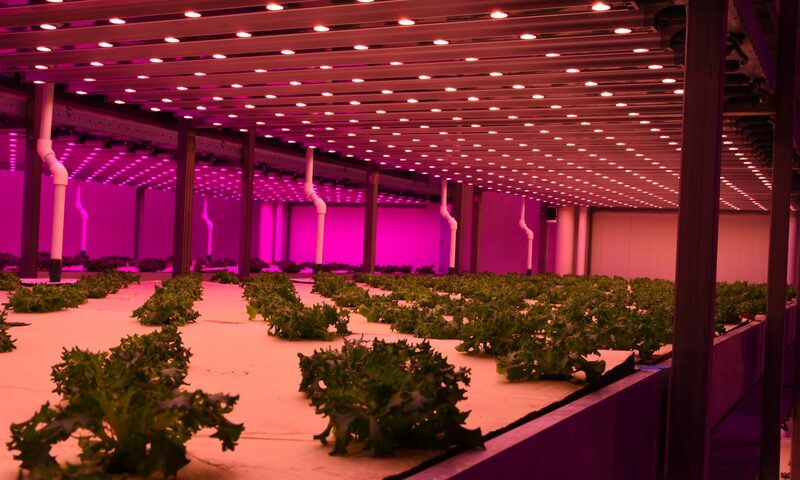 To have answers on optimum growth recipes Philips lighting Horticulture Led Solutions is building a large recipe database which will enable us to advice on the best recipe for growth and high-quality food production. We also propose trials in our vertical farming research centers for growth recipe research. Additional in-depth understanding on mechanisms involved in improving quality of fresh vegetables produce needs to be researched by Universities and Research institutes. Therefore, we have for many years a strong collaboration with Wageningen University in the team of Prof. Leo Marcelis. Baby leaves (10 to 15 cm long leaves) from lettuce, arugula and spinach and fresh herbs are more and more popular among consumers. For both categories of leafy greens and herbs, the consumer attaches a high value to the quality of fresh produce as well as food safety factors. The quality is a combination of many characteristics: its appearance (color, texture), taste, shelf life, nutritional value. In particular, healthy nutrients content becomes a quality attribute which is requested more and more by health conscious consumers. The result we observed on the vitamin C and K content of rocket and baby leaf spinach can potentially lead to a new opportunity in the retail chain. With nutrition labelling regulations in Europe, a significant vitamin C content is stated when the product contains 15% or more of the RDA (recommended dietary allowance) supplied by 100 g of fresh product. We have found a way to boost the nutrient content of baby leaf products using specific light recipe with well-defined growth conditions where we would be able to fulfill 100% of some of the RDA. Our research opens new opportunities in the food chain which was never possible in the horticulture history. Vegetables can be grown not only with a constant quality, but also specific nutrient content can be achieved or boosted. This new food production may enable possible in vivo research on human food nutrition and how gut metabolism is affected by the nutrient composition of specific vegetables having a well-defined nutrient content. And long-term, it will enable more knowledge on impact of food on human health. Plant science research needs now to connect with human food nutrition research to enable innovation. In this presentation I will show how a light recipe can have a strong impact on the quality of the food produced; that LED specific light recipes considerably improve the post-harvest qualities of leafy vegetables. Light quality is important because we have learned that growing crops in a closed environment, under sole-source lighting, can be optimized to meet or exceed post-harvest quality when compared to growing crops in traditional agricultural methods and practices. And we have learned that each crop/cultivar requires a unique recipe to ensure optimization. First, an optimized photosynthetic light recipe enables a high growth efficiency. Second, a specific light strategy enables producing tasty and nutritious leafy green with an extended shelf life. In addition, we have demonstrated that some attributes (nutrient content, appearances) can be significantly improved using a pre-harvest continuous-light strategy. This could allow for example to achieve a specific nutrient content or taste which could be guaranteed to the consumer. In addition, it would be interesting to investigate how this strategy could modify the taste and shelf life in order to market a premium product.